The University Flycasters and Student Chapter of the American Fisheries Societies, student organizations at the University of Wyoming, have for the past seven years hosted an annual Anglers Symposium on the campus of the University of Wyoming. The Symposium features angling topics and an expert panel program with speakers addressing topical issues of interest to fly fishers in the Rocky Mountain region. Jack Dennis has been the lead presenter at the Symposium since its inception. Jack brought Gary LaFontaine to the Symposium for several years, and Gary was a featured and beloved guest. Gary’s battle with ALS and death in 2002 affected us greatly. The profits from the 2001 Symposium were donated to Gary’s medical fund. view recent additions to the Lafontaine collection. To further remember Gary, and honor his many contributions to fly fishing, the University Flycasters inaugurated the LaFontaine Memorial Angling Book Collection of fine angling books in conjunction with the Symposium in 2002. The La Fontaine collection, which as of 2003 consists of nearly 60 titles, is maintained at the University of Wyoming’s American Heritage Center, Rare Book Collection. The LaFontaine collection joins the Frederick and Clara Toppan Angling Book Collection that was donated to the University of Wyoming on Mr. Toppans death in 1966. The Toppan collection has almost 500 highly-valued angling titles, including early editions of the Complete Angler, several Frederick Halford titles, an original edition of the Western Angler by Roderick Haig-Brown, and many other valuable titles. The Toppan Collection is supported by a permanent endowment from Mrs Clara Toppan that assures professional curation of both Toppan and LaFontaine angling libraries. To expand the LaFontaine collection, donations of valuable and rare editions of angling books published after the mid 1960s are encouraged, but selected titles published before Mr. Toppans death also are welcomed. 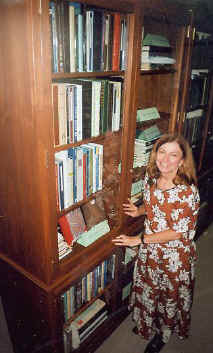 Because of limited space and the need to ensure high quality, titles donated to the LaFontaine collection will be reviewed by a panel consisting of Anne Marie Lane, Curator of the Toppan Collection, nationally known anglers/authors/publishers, as well as University of Wyoming students and staff.